This miso, honey, soy, garlic, and ginger glazed cod is perfectly cooked at lightning speed. It takes longer to cook the accompaniments than it does to get your gorgeous main dish on the table and it's perfect for either a quiet dinner at home or entertaining during Lent. Line a baking sheet with aluminum foil and oil it or spray it with non-stick cooking spray. Arrange the cod filets on the baking sheet. 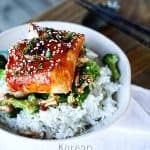 In a small bowl, whisk together or use a fork to combine the honey, vinegar, gochujang, miso, soy sauce, garlic, ginger and sesame oil. Separate out about 2 tablespoons of the mixture and brush it over the fish. Let the fish rest in the refrigerator for at least 30 minutes but up to an hour to let the fish marinate. Preheat your broiler to HIGH with a rack placed about 8 inches below the element. Scatter the prepared beech mushrooms around the fish filets and slide the pan onto the rack. Broil the fish for 3 to 5 minutes, or until the glaze is bubbly and charred in places. Remove the pan from the oven and turn the oven off of broil and up to 375°F. Brush the remaining glaze over the fish and return the pan to the oven for 5 to 10 minutes, depending on the thickness of your filets, or until they are opaque and flake easily with a fork. Serve over rice and steamed broccoli and garnish with toasted sesame seeds and thinly sliced green onions. If your cod filets are quite large, you will want to cut them into pieces that are about 4 inches at their largest point. The more evenly you can cut them, the more evenly they will cook. Also, if your cod is skin on, prepare it with the skin side down and then slide it from the skin before serving. *If you cannot find gochujang, you can substitute chili garlic sauce or sambal oelek. It will be slightly spicier, but still good. ***If you cannot find beech mushrooms, you can halve 1 cup of baby button or crimini mushrooms or thinly slice larger button or crimini mushrooms.